British actor Patrick Stewart, known mainly for his roles in Star Trek and the X-Men movies has arrived in Israel to take part in "Hunting Elephants," a heist comedy directed by Reshef Levy (Lost islands). Stewart will replace John Cleese, who was originally cast but quit due to heart problems. At the start of the press conference, Stewart recalled his previous visit to Israel a year ago, when he was on vacation before appearing in Shakespeare's "Mechant of Venice," saying he spent four wonderful days in Israel. He told friends and family how much he wanted to come back to Israel, and opportunity knocked in the form of Levy's funny script. Stewart expressed his happiness in returning to Israel not as a tourist, but as part of an Israeli film production. Stewart stressed he will be the only non-Hebrew speaking character in the movie. Therefore, as he pointed out to fellow cast member Sasson Gabai, he won't understand a word anyone says. Like any guest to Israel, Stewart was expected to share his thoughts on the Israeli-Palestinian conflict. Stewart, an Amnesty International activist who worked with Tony Blair when he was Prime Minister, said he thinks it's impossible to live in this world and be a-political. He said that if he were the leader of the US or Britain he would make solving the Israeli-Palestinian conflict his top priority. He expressed hope that within a few weeks he will have a better understanding of the situation in the middle east. 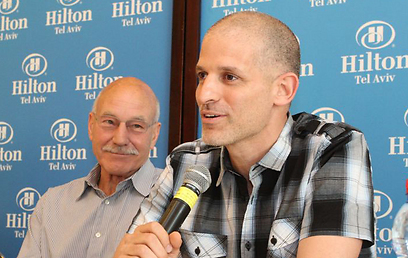 Director Reshef Levy said "The movie is based on my father's memoirs. Back in the day he was a bank robber and member of the Lehi organization. I wondered what he'd say about the situation of senior citizens today and if robbing banks was still relevant. We wrote a script with a part for an English actor. It was a bit pretentious – we sent it to John Cleese, who agreed to do it but sadly became ill. We sent it to Patrick who read it and agreed to come on board. I am very excited to work with him." 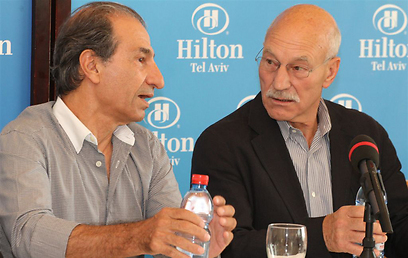 See all talkbacks "Actor Patrick Stewart in Israel"